"Compare Numbers" is not coming up in my list of nodes in the Node Library window. Other nodes from vuo.math are present. Is there anything additional I need to download? Has the name of the node changed? Try using one of the >, <, =, != symbols and see if it shows up, if not you should file a bug report. It shows up with me in Vuo 1.2.1. so I think it's supposed to be there. 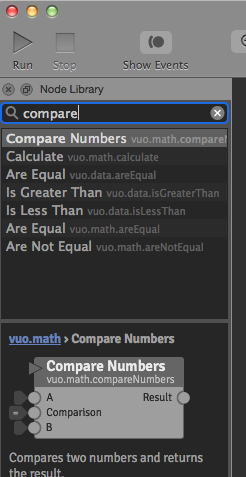 As Magneson said, Compare Numbers should be there in Vuo 1.2.1. It was added in Vuo 1.2.0, so if you're using an older version of Vuo, you won't see it. You can check the version by going to Vuo Editor menu > About Vuo Editor.